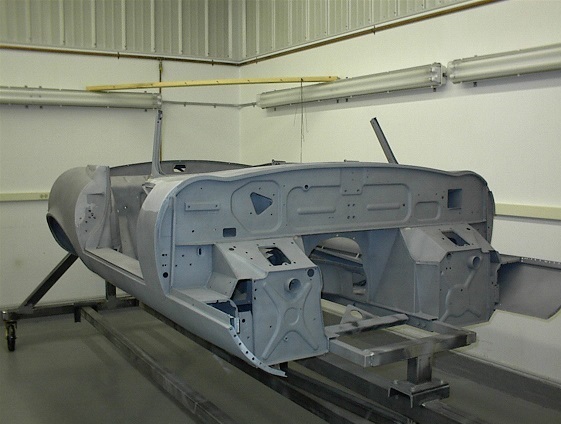 Ranging from partial to complete, Stew Jones Restorations are the best in North America. 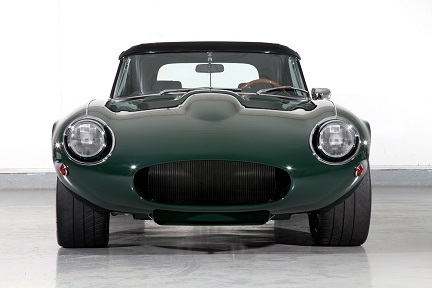 A complete restoration by Stew Jones Restoration produced the first 100-point Class 7 V12 E-Type judged by the Jaguar Club of North America. 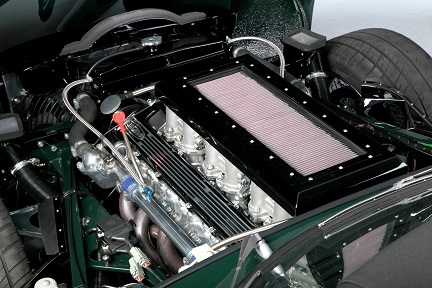 We have developed many specialized tools and equipment to restore the V12 E-Type. 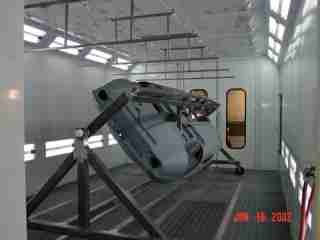 The Monocoque rotator allows 360° rotation for welding and painting. 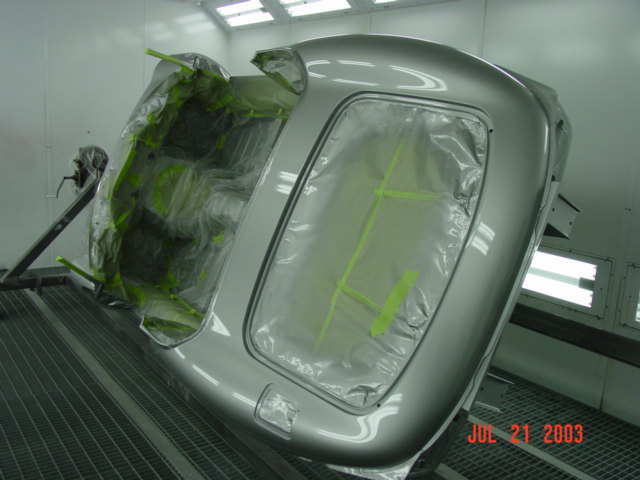 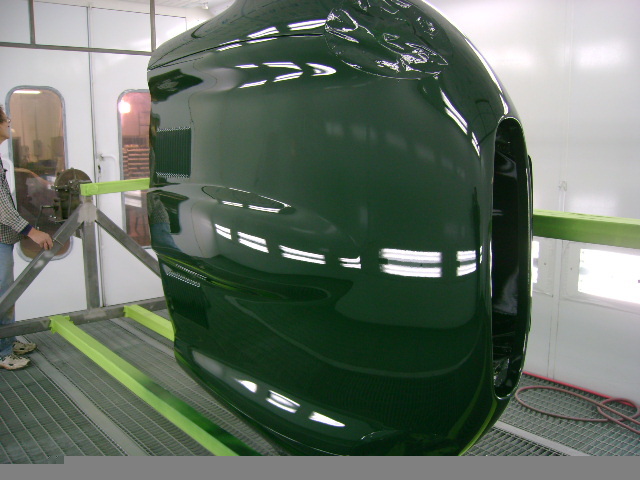 The Rotator is also used for bonnet painting, as it allows the inside and outside of the bonnet to be painted at the same time. 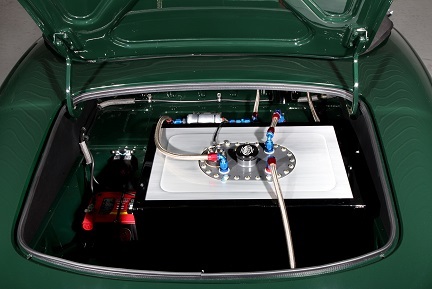 In addition to original restorations, Stew Jones Restoration offers high-performance modification options. 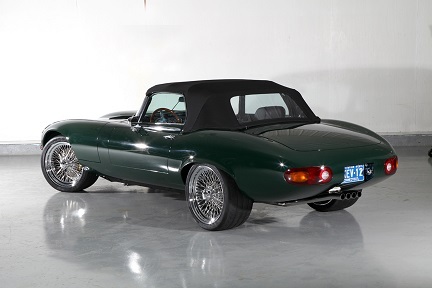 Pictured below is the "Coupster" in it's original configuration, a 1972 Coupe that was converted to a roadster, fitted with a 7.3L 600 HP engine, 5 speed, 14" brake discs, 335/30/18 tires and rims and body modifications to accomodate the wheels. 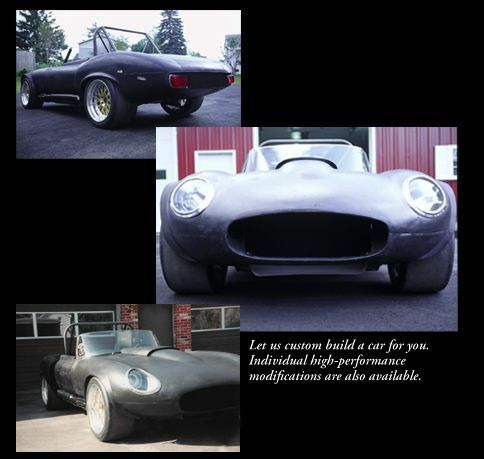 The Coupster is now being reconfigured with an 8" widening of the body, a 13" set back 10L engine and a C6 transaxle. 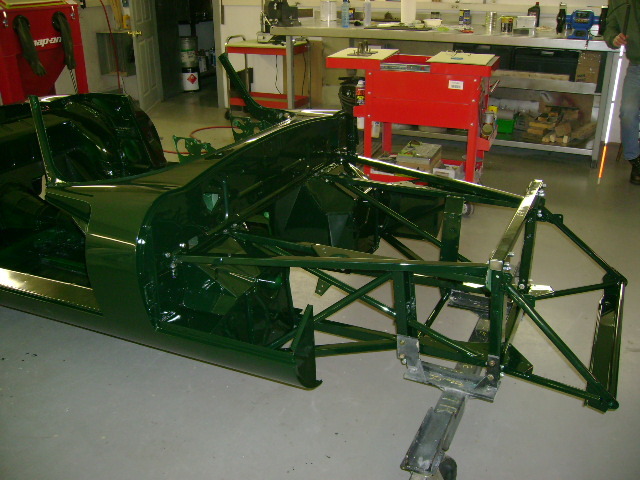 The last photo shows the conversion underway. 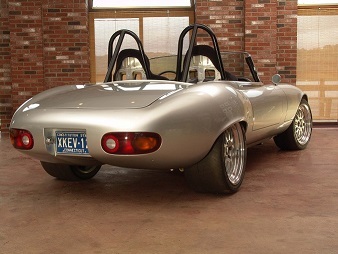 "The Beast" is our present track and slalom car which has evolved from a high-performance street car which in its present configuration features a lowered and set back 7.3L 650HP engine, a GT5 transmission, a dry sump oil system, 335/30/18 tires, side-pipes and carbon fiber bonnet. 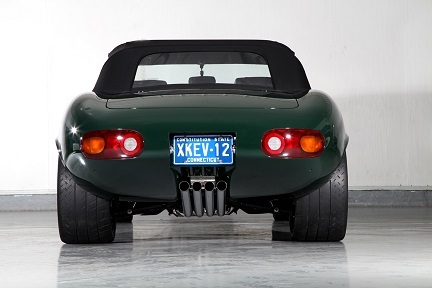 A street version of the race car features the Beast body styling with the traditional wire wheels 265/35/18 front and 285/30/18 rear, a docile 522 HP, 550 ft. lb, 7.3L with crank trigger Jenvey injection & custom ignition with Motec Mgmt system, a GT5-5 speed trans with G-force gears, triple disc Tilton Carbon-Carbon clutch, 13" AP front discs-ventilated rears and a 2800 LB curb weight. 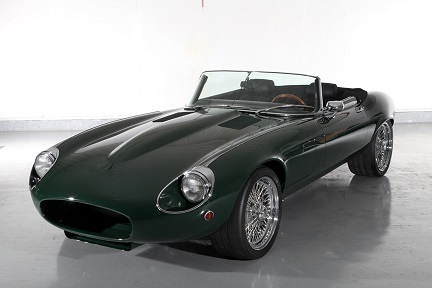 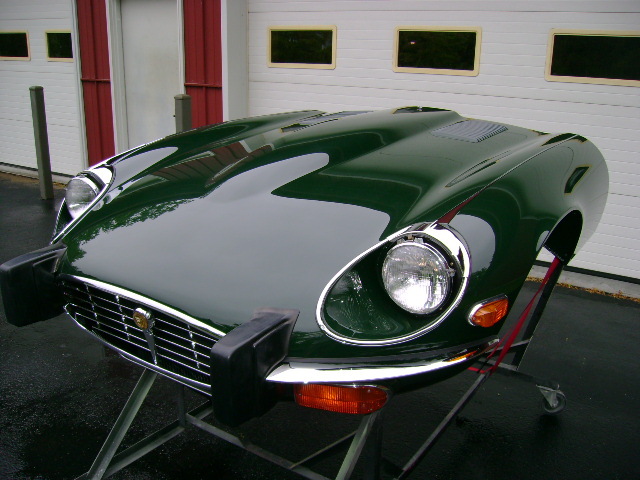 Stew Jones Restoration provides routine and extensive repair service on all 1971-1974 V12 E-Types. 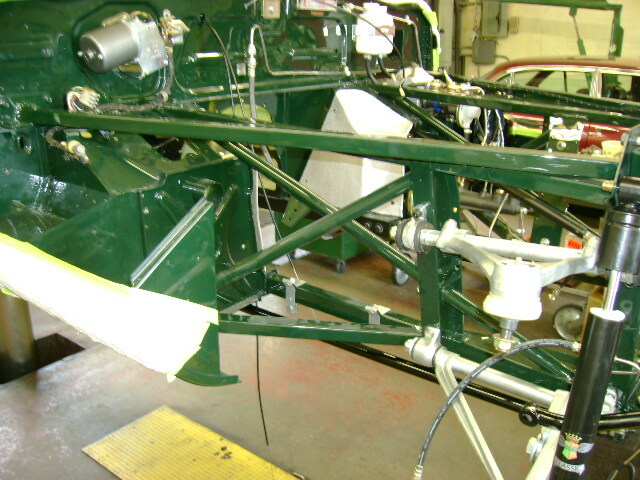 Work is performanced on a dual center post lift that supports the front and rear suspension to preclude underbody damage. 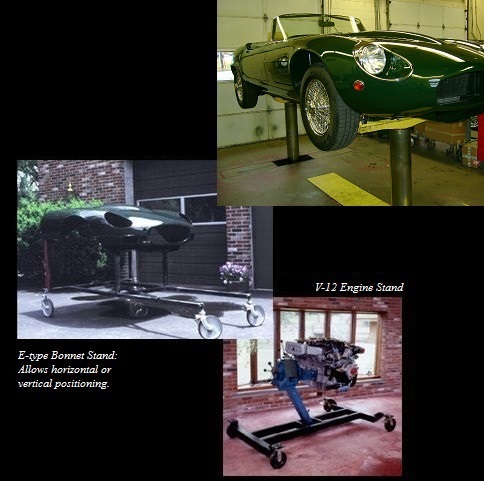 Thirty-seven years of experience provides a compreshensive insight into malfunctions and their causes. 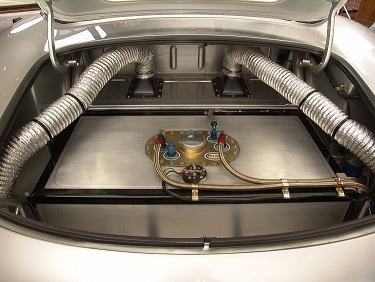 Dual center post support shown below.